Children who get threatening and unwanted text messages could soon have a way of fighting back. SMS and e-mail bullying has become increasingly common as more children have computers and their own mobiles. 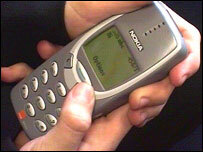 Research by children's charity NCH suggested 16% of 11 to 19 year-olds had received threatening text messages. But a new service for mobile phone operators could give young people the power to stop the unwanted messages getting to their mobiles from others. The service, Intelligent SMS Centre (iSMSC), means children who get bullying texts will be able to log the mobile number of the sender with their mobile operator. Any future messages from that number will then be stopped before it reaches the child's phone. "Traditionally, children were able to physically find refuge," explained Nils Granath, product director of Sicap who offer the service. "But the widespread use of mobile phones means that bullies can invade a child's personal space." It works in a similar way to anti-spam e-mail software, so mobile operators will also be able use the system to identify and stop block texts from spammers. Mr Granath told BBC News Online most major mobile operators will be employing a service like this in the next couple of months. The next stage planned for the system is a parental monitoring service which means parents would be sent a copy of every text message their child sends. John Carr, director of NCH's children technology unit, said he was sceptical about its effectiveness. "Anything that helps block unwanted message is welcome, but we haven't solved the prob of spam on the internet yet, so I fear it might not work," he said. Many websites also offer free SMS services, allowing text messages to be sent to phones anonymously via the net. "Someone who was seriously engaged in harassing someone by SMS would not use their own phone because it is too easy to trace," said Mr Carr. "They will go to a website to SMS, so I don't know how any bit of software can stop that." But Sicap say all SMS messages are coded, whether it comes from a mobile operators' network, another network or from a website. The iSMSC screens every message, so once it detects a code that it has been instructed to block it will stop the message from going through to the individual's mobile from then on. In August, Vodafone launched a similar trial service to control spam, VSpam, which made it easier to report unsolicited text messages to the Standards of Telephone Information Services (ICSTIS), the premium rate services watchdog.